John O'Groats has been named and shamed as the worst town in Scotland in the Carbuncle Awards 2010, its 'win' culminating a judging process which saw East Kilbride, Lochgelly, Inverness and Denny duke it out for the dishonour of receiving the notorious 'Plook-on-the-Plinth' accolade. This followed a rigorous selection process by the Urban Realm editorial team from a long list submitted by readers. 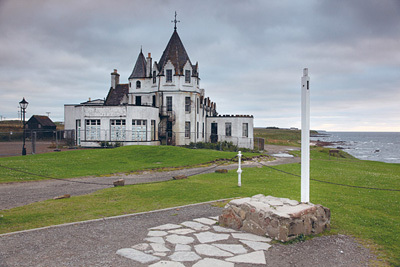 Home to Britain's most northerly derelict building this windswept outpost was marked down by our judges for its reliance upon tourist tat and its over commercialisation, evidenced most prominently by the famous John O'Groats signpost. Surrounded by a clutter of timber huts, caravans, portacabins and untended landscaping, its fingers should point to the North Pole, London, New York and so forth but instead one enterprising local 'photographer" sticks two up at passing tourists by affixing the missing signage for an £18 fee. Carbuncles spokesperson John Glenday said: Last, most definitely last, in our cross country trek was John O'Groats, despite having traveled so far north to be there our enthusiasm swiftly head south upon clocking the disparate assortment of steadings struggling to assume the stature of a hamlet. Housing scant reward for the many hours spent cooped up in a car navigating the winding A9 out of Inverness, never mind hardier travelers on two wheels and none, the overriding temptation upon reaching the famous northerly cliffs is to chuck oneself off them. 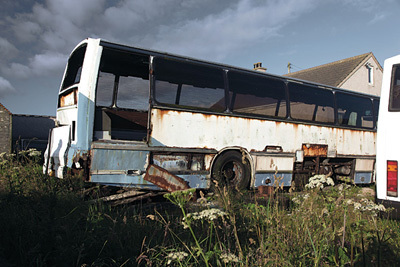 "John O'Groats may be geographically on top of the world but its built environment is scraping bottom. Its great distance should be no excuse for losing sight of the fact that this motley agglomeration of buildings on the edge of the sea that so many travel so far to see is unduly prominent internationally. What sort of impression is this torrid environment making on those who have traveled furthest to see it and what must they report to family and friends back home? Until this northerly outpost starts treating its guests with respect there can be no hope of becoming a genuinely significant tourist draw." Carbuncles judge Drew Mackie added: "Having cycled 800 miles from Land's End to get here I would wonder why I bothered. This is the most anti-climactic tourist attraction that I know - and the UK is not lacking in these. An air of dereliction hangs over the place. Not surprising as the main hotel building is derelict and the most striking feature is a large car park. Various tourist haunts hang around this and give the impression of not wanting to look at each other like early arrivals at a party. The whole effect is augmented by a series of sheds and caravans, lurking with tourist intent." Mark Chalmers echoed this disappointment stating: John O'Groats is a point of departure: it's a place for leaving Scotland behind, and John O'Groats has been left behind by Scotland. There is no sense of arrival here, nor anything to attract anyone other than the abstract notion of the edge of Scotland." GVA Grimley have put together a grim masterplan for the area, it postulates a village street with commercial outlets backed by copious car parking space and is to be developed in tandem with plans by Heritage Great Britain to refurbish the derelict hotel together with a sweep of "high quality housing", but as Mackie articulates: "neither scheme gets the design juices flowing". Indeed if the plans are implemented in anything like as cack handed a manner as the existing landscaping, which boasts bizarre serried line of fake Victorian lamp standards and a picnic bench marooned on a traffic island boxed in by recycling bins, then the omens would appear ill indeed. A dishonourable mention went to the Stirlingshire town of Denny which is currently lumbered with a giant mouldering "Battenberg cake" of a town centre. 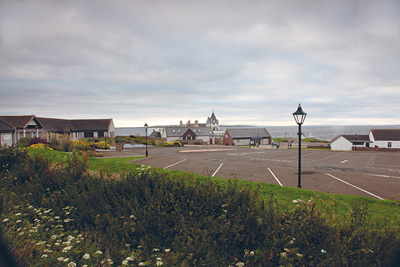 It was felt however that John O'Groats status as an international tourist draw made its depredations all the more damaging for Scotland as a whole. Glenday said: What distinguished Denny first and foremost in our minds was the impassioned outrage of the many locals we met. Wanting only for pitchforks the townspeople did not shy from articulating the disdain with which they held the decaying mess masquerading as their town centre". The announcement was made in tandem with that for Scotland's worst new building, a structure so remarkable in its shabbiness it was actually on a shortlist of one. The St James Retail Centre in East Kilbride raised two key concerns for our judges, the building itself and its location. Scotland's most successful New Town is getting too many rag tag, peripheral schemes that are in danger of sending its town centre into a spiral of decline, and turning it into a Carbuncle of the future.